St Nicholas Church is located in San Anselmo, Marin County, CA, approximately 15 miles northwest of the Golden Gate Bridge. Take Highway 101 north to Sir Francis Drake Blvd west. In San Anselmo, turn left on Ross Ave. The Church is on the right one and a half blocks down. Take Highway 101 to the Central San Rafael exit and turn right on Third St to Sir Francis Drake Blvd. Turn left on Sir Francis Drake and right on Ross Ave.
Cross the Richmond Bridge. Take Highway 101 to the Central San Rafael exit and turn right on Third St to Sir Francis Drake Blvd. Turn left on Sir Francis Drake and right on Ross Ave.
Services are in English, with some Slavonic used. 6:00 PM All-Night Vigil, Confessions (7:00 PM from Pentecost through the Elevation of the Cross). Please visit the Monthly Calendar on the parish website for the schedule of other services. Please call the Rectory to arrange Baptisms, Marriages, Memorials, Thanksgiving Services, etc. The first chapter of the parish’s history is pretty much like that of most Russian Churches in the San Francisco Bay Area. Its founders were among the thousands of Russians displaced by the Bolshevik Revolution who had fled eastward through Siberia to Manchuria and China before coming to America. Many of these new Californians, having earlier made their home in the Russian enclave of Harbin, formed a colony in San Francisco, where Holy Trinity Cathedral had already been in existence since 1868. When the Golden Gate Bridge was completed in 1937, many refugees now fled the fog and moved across the Golden Gate into sunny Marin. By the early 1950′s, a movement began to establish a satellite community in the San Rafael area. 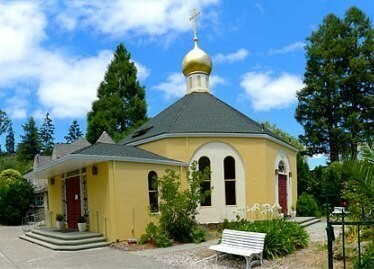 In 1956, Archbishop John (Shahovskoy) blessed the permanent home of St. Nicholas parish in San Anselmo and assigned Fr. Boris Symeonoff (b.1911- d.2007) as the first pastor. The next stage of the parish’s life also was typical of most emigre communities. Under the capable spiritual leadership of Fr. Boris and with the cooperation of a zealous flock, the numbers slowly grew and a new temple was constructed. After thirty years of dedicated ministry, “Batiushka” retired and Fr. Michael Prokurat (b.1950- d.2003) was assigned as rector. Faced with an aging flock, and the semi-churched and sometimes totally unchurched children and grandchildren of the founders, a different pastoral medicine needed to be applied. Fr. Michael had the Orthodox theological foundation and vision, his own life experience as an Orthodox American parenting his own children, and the courage to teach the unchanging Tradition of the faith in these special circumstances. By the grace of God, a new era had begun. Today, in our sixth decade, St. Nicholas parish is faced with entirely new options and challenges. Many have noticed that Marin County — once the center of the “post-Christian” movements of the sixties and seventies of the 20th century, is now entering a “post post-Christian” era. Some of the children of those who long ago abandoned the Judaeo-Christian structures of American “secular” religious cultures are now seeking to discover the real roots of those traditions. Hardly a week goes by without the presence of a new “seeker”. The possibilities for mission are immense! This wonderful opportunity, however, presents its unique challenges. The community is no longer culturally or socially homogeneous as in the post-Harbin days. There is hardly any remnant of those with even childhood memories of church life in Pre-Revolutionary Russia. There is still a presence of the “second wave” of Russians who came via Western Europe as well as the Far East. Their children and grandchildren with their unique mixed cultural experience make up a significant part of the community. Then, of course, there are the “transplants” from Orthodox parishes “Back East” with their own memories of church upbringing. Over the years, many committed Christians of various non-Orthodox denominations have embraced the Orthodox Faith and are among the most active members of the parish. As we enter further into the 21st century, we have been blessed by the presence of more and more “native” Americans with no previous religious formation or affiliation. Last, but not least, the community has been greatly enriched by a number of recent immigrants from various republics of the former Soviet Union. Every local church is called to be orthodox in faith and also truly “catholic” in the sense of being capable of embracing everyone who seeks Christ. The challenge to St. Nicholas parish in San Anselmo is to be faithful to the Tradition handed down to us, as well as being visible and open to the community around us. In addition to a relatively full liturgical life and educational program, a few attempts are being made to reach out beyond the walls of the temple. For many years we have opened our facilities to Twelve Step meetings. The “rent” received goes directly to support local food kitchens and homeless shelters. There is an ongoing food basket collection. These and many other charitable activities are guided by the Good Works and Community Outreach Ministry branch of the parish council. On the Feast of Theophany (January 6), the entire parish processes from the temple throughout the downtown area to San Anselmo Creek for the Great Blessing of Water. Leaflets explaining the service as well as a brief introduction to the Orthodox faith are distributed along the way. Every year, on August 6, the Feast of the Transfiguration, the community, with Cross, banners, and icons, climbs to one of the summits of the nearby coastal range overlooking West Marin, Ross Valley, Berkeley, Oakland, and San Francisco. The Festal hymns, Gospel, and the renowned sacred poem “Glory to God for All Things” are proclaimed throughout the hills of the North Bay. Both these events are expressions of our experience of the new and transfigured creation wrought by the Incarnation, death, and Resurrection of Jesus Christ. Indeed, every parish gathering should make us mindful of our commission to be the local Body of Christ. This is a call to evangelism, ministry, charity, and to finding ways to baptize the good in this culture and to touch the lives of all those in our community.